While some sofa sports-fans subscribe to every sports channel under the sun, others prefer to adopt a more selective strategy to ensure they get enough bang for their buck, without tying themselves into long-term contracts that leave their bank balance rather bare. Indeed, ESPN through Top Up TV in the UK, for example, sets you back £10 (€12) a month with no long-term commitment, while Eurosport Player gives you access to the main two Eurosport channels (1 & 2) through a Web player and mobile app. How much? £2.99 (€4.49) a month if you commit to one year, or £4.99 (€6.49) if you only want a single month. Great for one-off tournaments, if you’re interested in the likes of the Australian Open. Just to recap, Eurosport is a European-wide TV network operated by French broadcaster TF1 Group, with Discovery Communications Incorporated taking on a 20% share just last month. 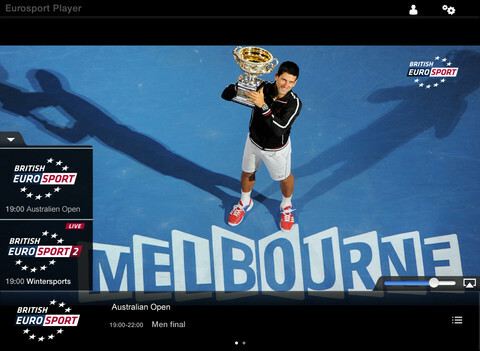 Its online subscription service, Eurosport player, was rolled out back in 2008, with the iOS version launching in December 2011, followed by Android last June. There’s also versions for the Kindle Fire/HD, as well as smart TVs from Panasonic and LG. Thus far, there has been a major sticking point in Eurosport’s online offering. If you subscribed to the online Web player, your subscription didn’t apply to the mobile apps. And vice versa. You needed two separate subscriptions to access both platforms which, quite frankly, was ridiculous and raised the ire of the mobile masses. Now though, Eurosport has taken the undoubtedly popular decision to unify its subscriptions and make them work across multiple screens. This is a big win for those who like the ‘less popular sports’ – i.e. not the major football leagues and tournaments. Depending on where you live in Europe (this write-up is based on the UK offering), you can get 3 of the 4 grand slam tennis events, and the Davis Cup and other WTA and ATP tournaments, while the Tour de France (cycling), African Cup of Nations (football), World Championship (snooker), Wintersports World Cup, and many other events are also on Eurosport. It’s worth also noting that many users, myself included, have encountered a bug when accessing the new multi-device feature on Eurosport Player. If you sign-in to your account on the mobile app, and it says your account has expired when you know for a fact it hasn’t because you can access it fine from a computer, you may need to tweak your account settings to activate it. 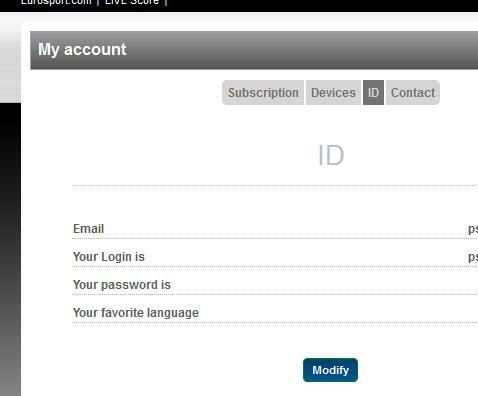 To do so, sign in to Eurosport Player through the Web-based version, and click on ‘My Account’ in the top right corner. Click on ‘ID’, then replace your current login with the email address you used to subscribe on the website, then click ‘Save’. So your login should be the same as your email address, and you shouldn’t have a separate username. I tried this solution out, and it certainly worked for me. So, assuming you get this working, how is the app in itself? Well, judging by the iPad app, it streams very well and it’s easy to navigate between channels. The one thing I would say, however, is that it really needs a start/stop function, just as the Web player has. Unless I’m being very dim, you have to either close the app altogether, or lower the volume, if you need to momentarily pause play. Probably not a deal-breaker, but a very odd omission nonetheless. So, for sports fans across Europe, this quiet update will likely prove popular. And judging from our experiences, the respective app reviews on Google Play and the App Store should start improving moving forward…the major gripe thus far has been the multi-subscription issue.